Colonel (later General Claire Lee Chennault) had been in China since the mid-Thirties. An outspoken advocate of "pursuit" (as fighter planes were called then), in an Army Air Force dominated by strategic bomber theorists, he alienated many of his superiors. But in China, equipped with P-40's, he developed the basic fighter tactics that American pilots would use throughout the war. The Japanese planes used over China were much more maneuverable than his Warhawks, whose advantages were speed in a dive, superior firepower, and better ability to absorb battle damage. Chennault worked out and documented the appropriate tactics that capitalized on the relative strengths of the American fighters: intercept, make a diving pass, avoid dogfighting, and dive away when in trouble. This remained the fundamental U.S. fighter doctrine throughout the Pacific War. 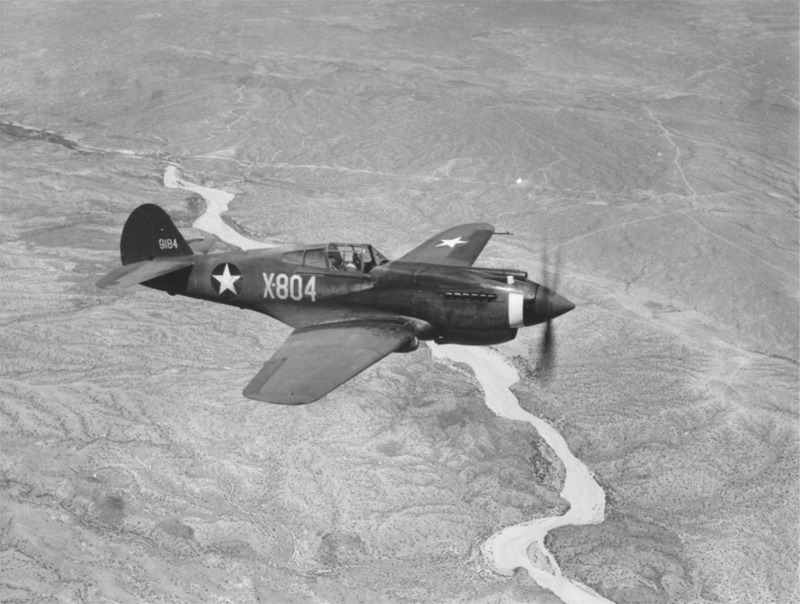 Chennault's American Volunteer Group, popularly known as "The Flying Tigers" flew their P-40B's and P-40C's with great success against the Japanese aircraft. The British also used the P-40, called Tomahawk and Kittyhawk, especially in the North African and Mediterranean Theatres. Seeing many fighters using in-line, water-cooled engines to great advantage, in 1938 Curtiss-Wright decided to adapt its model P-36 Hawk to the Allison 1710, an 1160 HP engine. Designated the XP-40, the prototype was simply a P-36 with the in-line engine; it took its first flight in October, 1938. For guns, it only carried a pair of 30 caliber machine guns, not uncommon for the late 1930s, but puny as World War Two developed. The Army promptly selected the Curtiss airplane for production, ordering 524 in 1939, the largest order for an American fighter at that time. At $13 million, each one cost $25,000 dollars. Even before America's entry into the war, it became evident that more powerful weaponry was called for, The Buffalo plant began to outfit the P-40B with four (wing-mounted) 30 caliber and two (nose-mounted) 40 caliber machine guns. The "B" model also introduced cockpit armor. With war looming, 107 Warhawks (P40's and P-40B's) moved up to the Philippines by December, 1941. The Japanese onslaught caught them unawares, and four days later only 22 remained. Buzz Wagner of the 17th Pursuit Squadron was one of the few Americans to achieve any success in those dark days in the Philippines. Flying a P-40, Wagner downed 5 Japanese planes before being evacuated to Australia in January 1942. Keeping of the early P40 models, with some originally designated for Lend-Lease delivery to the British, as "Tomahawks," and other hurriedly shipped over to China for the AVG, is complicated. 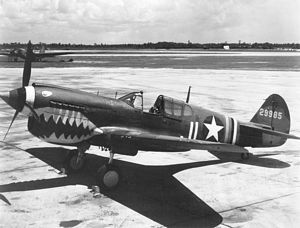 To this day, debates rage over the Flying Tigers version: Was it the P-40B or P40C? Self-sealing fuel tanks marked this variant, over 900 went to the British, for use in North Africa. The USAAC received 193. The slowest of all P-40 models, the P-40C had a top speed of only 345 MPH (some sources say 328). Over Egypt, "Tomahawk IIB" was no match for the Bf-109E and was soon relegated to ground attack. Marked by a deeper chin radiator, the P-40D's profile visibly differed from earlier versions. Curtiss also switched the four wing-mounted guns to heavier 50 caliber types, and got rid of the nose-mounted guns - and with them the need for through-the-prop synchronization gear. With a more powerful Allison 1710-39, the P-40D could make 362 MPH in level flight. The Brits took delivery of most of the "D" models, and distinguished them from earlier "Tomahawks" with the name "Kittyhawk." 2,320 P-40E's rolled off Curtiss production lines, mostly in 1942. Continuing the trend to bulk up, it carried six 50 caliber machine guns in the wings, ultimately the most common armament of American fighters in WW2. Two-thirds of them, designated Kittyhawk Mk IA, went to the RAF, the RCAF, the RAAF, and the RNZAF. As the weight of the Warhawk had crept up to almost 9,000 lbs, Curtiss installed the powerful Merlin engine on the P-40 airframe. The prototype, XP-40F, achieved a top speed of 373 MPH. Inevitably, the P-40F production version weighed even more (9,870 lbs) and speed dropped off to 364 MPH. Starting in August, 1942, Curtiss-Wright produced the "K," which incorporated Allison's latest engine, the 1710-73, capable of 1325 HP. Otherwise the "K" was similar to the "E."
This was a stripped-down version of the P-40F, dubbed the "Gypsy Rose Lee," with 2 guns, armor, and some fuel removed to save weight. These efforts only increased the speed by 4 MPH over the F model. 720 were produced. Allison's 1710-81 engine, rated at 1360 MPH, powered the P-40M. 600 were produced, mostly delivered to the RAF. The final Warhawk, the P-40N, entered production in late 1943; eventually 5,000 were built. Powered by the Allison 1710-99, the "N" could make 378 MPH, at least in the lightened-up early production blocks. But more weight was added back, and typical P-40N's topped out at 350 MPH. P-40F Dec-41 1,560 364 6 1,300 Packard V-1650-1 2,100 34,400 700 1,500 6,590 8,500 9,350 1 1 Kittyhawk II new eng. This book covers in detail the eleven U.S. fighter aircraft types planes produced just before and during World War II - with a combined production total of just over 100,000 aircraft. Covered are the Army Lockheed P-38 Lightning, P-39 Airacobra, Curtiss P-40 Tomahawk/ Kittyhawk/ Warhawk, P-47 Thunderbolt, North American P-51 Mustang, Northrop P-61 Black Widow, and the Navy F2A - Buffalo, F4F - Wildcat, F4U - Corsair, and F6F - Hellcat fighters. The text is supplemented by more than 650 photographs, and 200 tables and graphs. Fighter production figures are also included. After an introduction of each type, a heavily illustrated overview of earlier inter-war production from 1920-on, along with a discussion and illustration of wartime experimental types, is provided. A lengthy section considering several technical factors affecting fighter performance follows. These include engine models, supercharger types, propellers, aerodynamic thrust, lift and drag, aircraft weight, balance, stability and control, and armament. America's Hundred Thousand also provides details of each U.S. World War II production fighter in terms of models and changes, numbers planes produced, and major engine and aircraft performance aspects - in tabular and graphical form - details of weights, discussion of handling qualities and general comments, along with detailed descriptions containing many illustrations of aircraft structures and systems showing the technology of that time. In addition a comprehensive week-to-week and month-to-month chronology of development and wartime combat operational life for each fighter is provided, including many photos. This study concludes with comparisons of the eleven types in terms of program milestones, aircraft drag, power available at various altitudes, speed, climb, rolling and turning, acceleration, and diving performance, as well as general evaluations by World War II pilots.